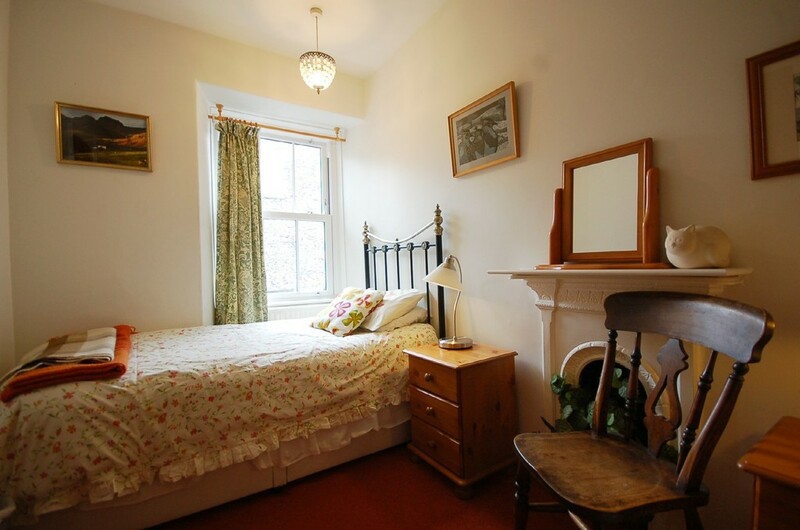 Brampton is a well presented mid-terrace traditional stone built Lakeland cottage retaining plenty of character and charm with traditional features including original fireplaces, red quarry tiled flooring and picture rails. This attractive and deceptive property offers spacious accommodation spread over three levels comprising lounge, dining room, kitchen, basement, two first floor double bedrooms, a single bedroom and a family bathroom. The property is finished with gas central heating and double glazing throughout with the benefit of a private patio garden to both front and rear aspects and unrestricted on street parking. 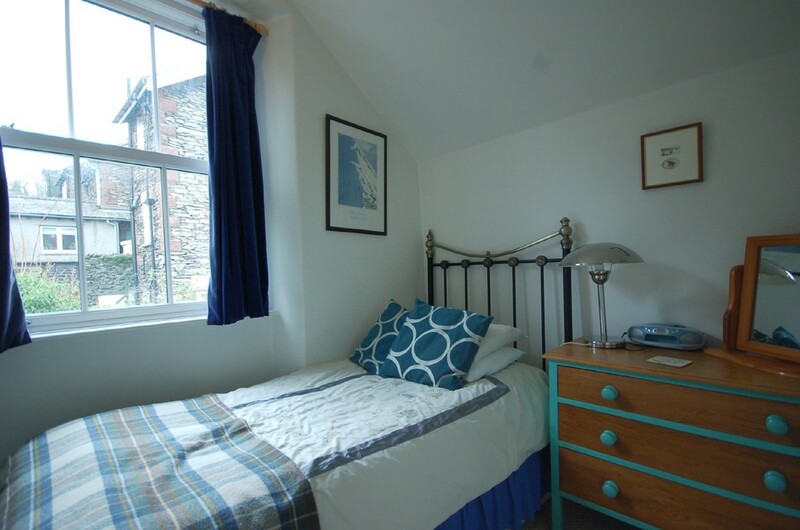 The property is currently run as a holiday let and is an ideal location close to the busy tourist hot spot of Bowness and will appeal to a variety of buyers who are looking for a holiday let, second home or permanent family home. 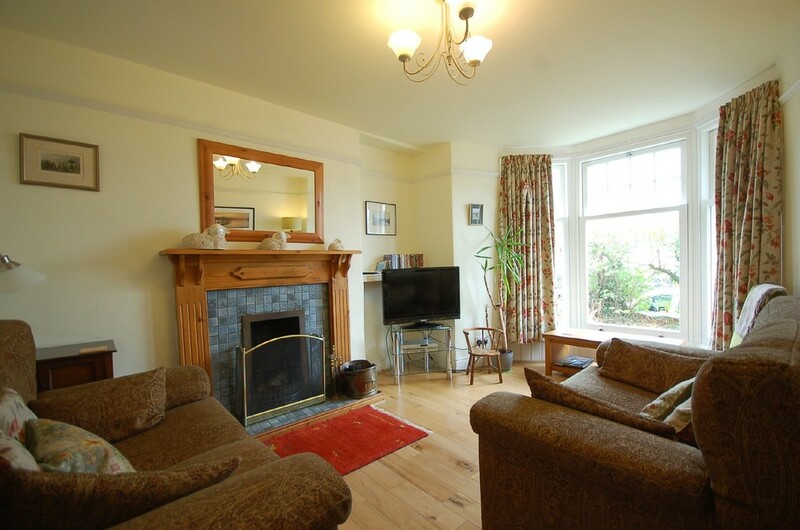 Occupying a peaceful yet extremely convenient central village location with the shops, restaurants, cafes and bars of Bowness right on the door step. 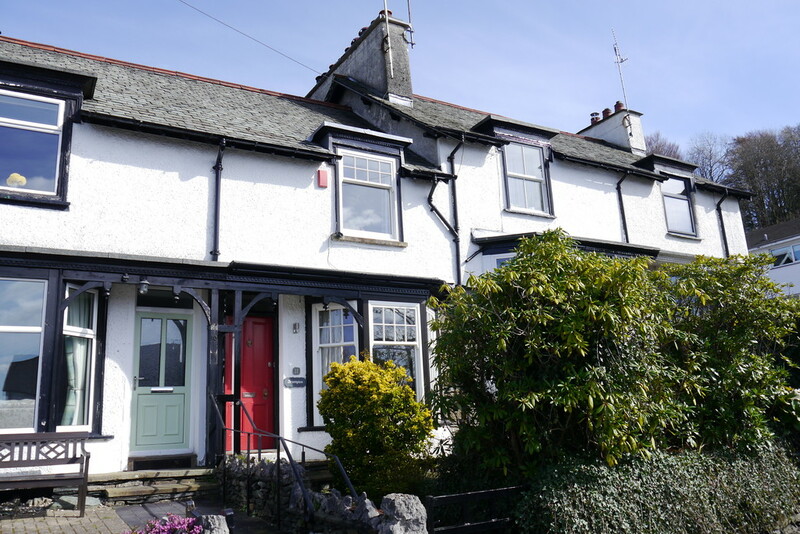 This traditional style Lakeland property is situated between the villages of Windermere and Bowness with a large range of local amenities and tourist attractions close at hand, transport links including train, bus and Lake Cruisers are all within easy walking distance and offer excellent accessibility to enjoy the beautiful Lake District National Park. Some furniture and contents could be available by separate negotiation. Directions From our Windermere office head towards Bowness on Lake Road/New Road passing the police station and take the next left on to Beresford Road with Beresford’s Restaurant on the corner. Brampton, 11 Beresford Road is towards the end of the second left hand terrace. Lounge 10’9" x 9’11" (3.26m x 3.03m) A fantastic light and airy sitting room with deep UPVC double glazed bay window. 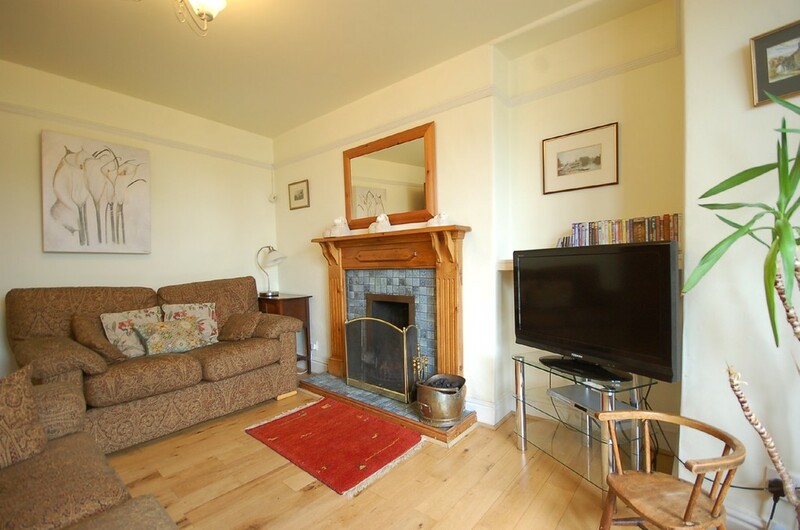 Central to the room is a open fire on a blue tiled hearth and surrounded with a pine mantle . The room is finished with picture rail, deep skirting boards and wooden flooring. Dining Room 12’4" x 9’9" (3.75m x 2.98m) Formal dining area with ample space for large dining table with a double glazed sash window looking out to the rear patio garden. 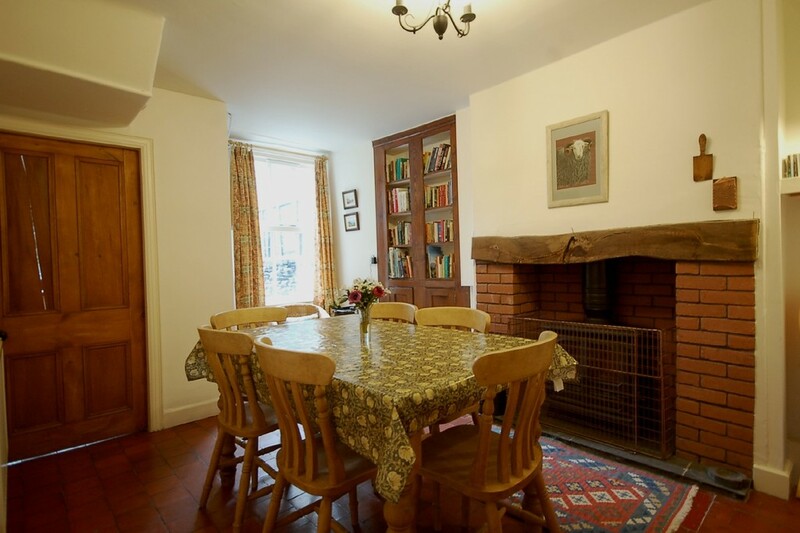 There is an original red quarry tiled floor and a large multi fuel stove on a slate hearth set in an ingle nook fireplace with a wooden mantel over and adjacent is a recessed built in bookcase. Kitchen 12’6" x 7’6" (3.81m x 2.28m) Fitted kitchen with a good range of white fronted wall and base units incorporating sink unit and finished with laminate work surfaces. Freestanding gas cooker with extractor fan over and dishwasher. Space for fridge and freezer and plumbing for a washing machine. 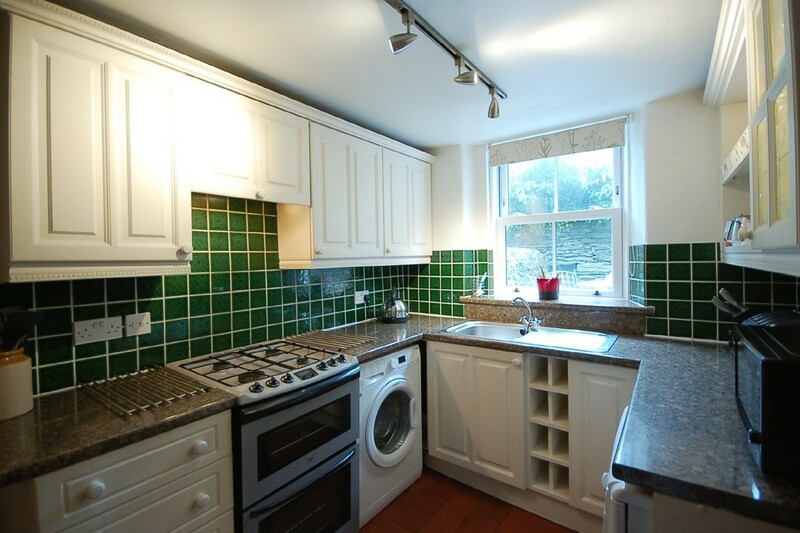 The kitchen features a UPVC double glazed sash window to the rear aspect and door leading out to the patio garden. Finished with traditional red quarry tiled flooring, tiled splash back and spot lighting. The cooker, dishwasher and fridge are included in the sale. Basement Room 13’3" x 11′ (4.03m x 3.36m) Good size room with window to front aspect providing light, good space for storage with an additional large cupboard. 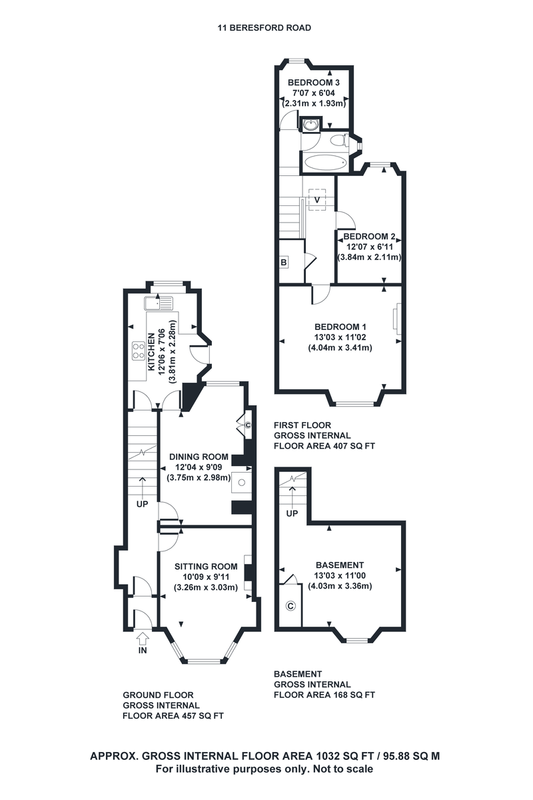 This area could be utilized into further living accommodation subject to renovation and building regulations. There is a freezer and further fridge/freezer included in the sale. Stairs to split level landing with skylight and loft hatch access. Bedroom One 13’3" x 11’3" (4.04m x 3.14m) Large double bedroom to the front of the property with UPVC double glazed sash window enjoying a pleasant outlook over neighbouring rooftops towards Claife Heights. 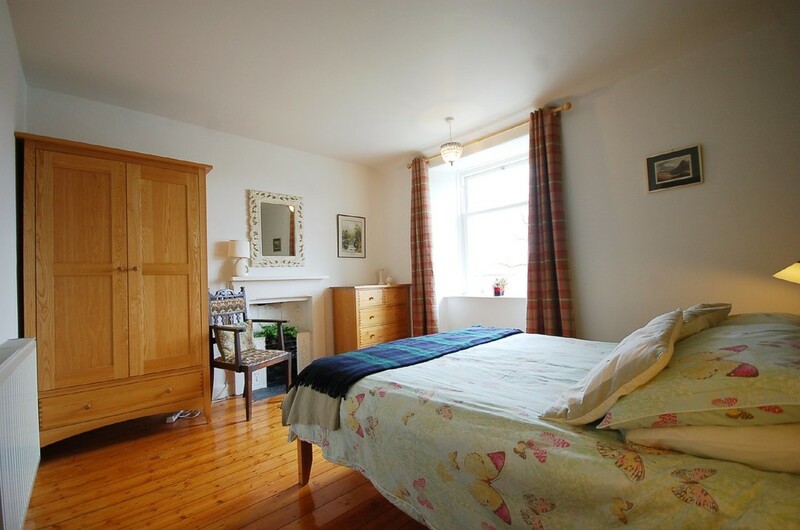 Plenty of space for wardrobes, generous ceiling height and finished with an original cast iron decorative fireplace, stripped pine floorboards and radiator. Bedroom Two 12’7" x 6’11" (3.84 x 2.11m) Twin bedroom with UPVC double glazed sash window over looking the rear garden, wardrobe and original cast iron decorative fireplace. Bedroom Three 7’7" x 6’4" (2.31m x 1.93m) A single bedroom with a UPVC double glazed sash window over looking the rear of the property, with a radiator and a hanging space. Bathroom House bathroom comprising panelled bath with chrome mixer taps with shower over and vanity wash basin and WC. 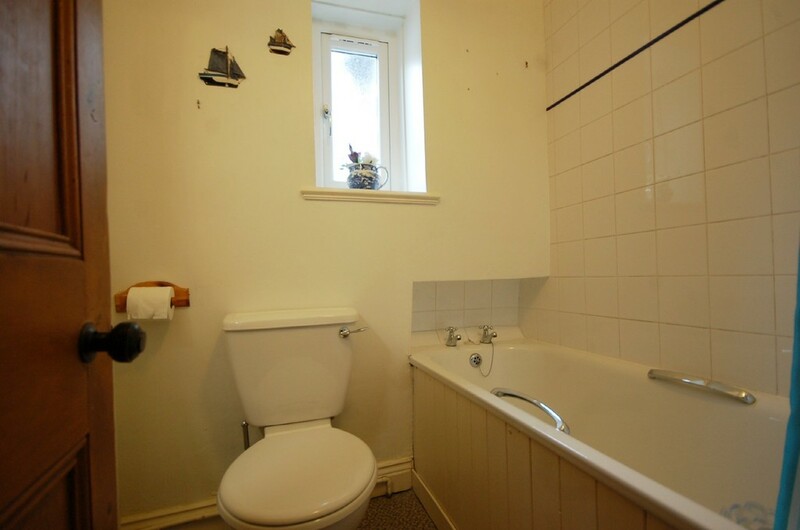 The bathroom is finished with part tiling to walls and cushioned flooring, inset ceiling lighting, mirror and UPVC double glazed sash window. Outside To the front of the property is a graveled garden area enjoying a sunny southwest aspect with an array of plants and shrubs. 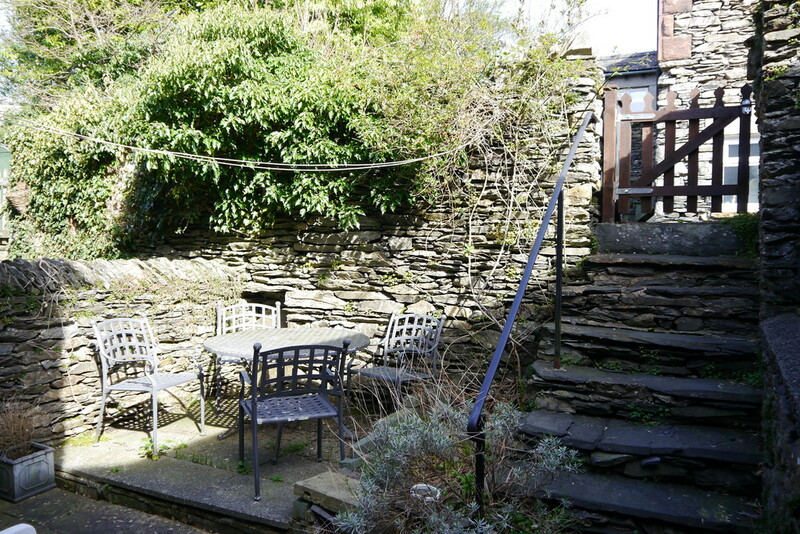 At the rear of the property is a private enclosed patio garden and stone steps onto a rear access lane. Services All mains services connected. Gas fired combination boiler.